he Cardsharps (painted around 1594) is a painting by the Italian Baroque artist Michelangelo Merisi da Caravaggio. 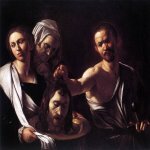 The work represents an important milestone for Caravaggio. He painted it when he was attempting an independent career after leaving the workshop of the Cavaliere Giuseppe Cesari d'Arpino, for whom he had been painting "flowers and fruit", finishing the details for the Cavaliere's mass-produced (and massive) output. Caravaggio left Arpino's workshop in January 1594 and began selling works through the dealer Costantino, with the assistance of Prospero Orsi, an established painter of Mannerist grotesques (masks, monsters, etc.). Orsi introduced Caravaggio to his extensive network of contacts in the world of collectors and patrons. The painting shows an expensively-dressed but unworldly boy playing cards with another boy. The second boy, a cardsharp, has extra cards tucked in his belt behind his back, out of sight the mark but not the viewer, and a sinister older man is peering over the dupe's shoulder and signaling to his young accomplice. The second boy has a dagger handy at his side, and violence is not far away. It was the second such painting Caravaggio created. The first, The Fortune Teller, had drawn attention, and this painting extended his reputation, small though it was at this stage. The subjects of The Fortune Teller and Cardsharps offered something new, realistic scenes of street life, especially with this beautifully rendered attention to little details such as the split fingers on the older man's gloves, or the teenage cheat's anxious glance at his master. The psychological insight is equally striking, the three figures bound together by the common drama, yet each with his own unique play within the larger play - for if the innocent is being duped, the other boy is no older, another innocent being corrupted even as he cheats his gull. 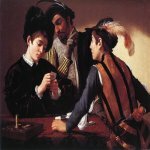 Cardsharps, with its mixture of brutal low-life realism and luminous Venetian delicacy, was much admired, and Orsi "went around acclaiming (Caravaggio's) new style and heightening the reputation of his work." Over fifty copies and variants made by other painters have survived, with artists such as Georges de La Tour painting their own appreciations of the theme. Whether through Costantino or Orsi, Caravaggio came to the notice of the prominent collector Cardinal Francesco Del Monte, who purchased Cardsharps and became the artist's first important patron, giving him lodgings in his Palazzo Madama behind the Piazza Navona, then as now a main square in Rome. 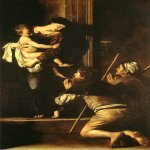 Del Monte's collection the work entered the collection of Cardinal Antonio Barberini - nephew of the Pope Urban VIII whose pre-elevation portrait (Portrait of Maffeo Barberini) Caravaggio would paint in 1598 - in Rome, and was passed through the Colonna-Sciarra family. It eventually disappeared in the 1890s, and was rediscovered in 1987 in a private European collection. 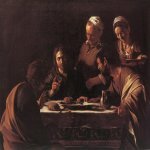 British art historian Denis Mahon discovered in December, 2007, that a copy of Cardsharps previously believed to have been the work of someone else was actually Caravaggio's own. The pentimento, in which full detail of the face of one of the cheats had been sketched in spite of being painted over by the page's hat pointed to the extreme unlikelihood that it was done by a copy artist.